Major League Baseball's opening day is today. For Red Sox and Yankee fans, however, the real opening day occurs on April 8th, when the Sox and Yankees go head-to-head for the first time of the season. Whether you like to admit it or not, the Red Sox-Yankees decades-long rivalry is the biggest draw for Major League Baseball. Plus, there are the hotties (Derek Jeter), lovable sluggers (Big Papi), fierce pitchers (Josh Beckett, Mariano Rivera) and, most importantly, killer food. I'm not talking about Cracker Jacks and hot dogs. I'm talking about sausages. Outside of Fenway Park, there are over a dozen food carts manned by loud, beefy Boston food vendors hawking sandwiches filled with everything from kielbasa to steak tips. It's the humble Sausage and Pepper Sandwich, or "sangwich" as it's often called, that is the most beloved of all. 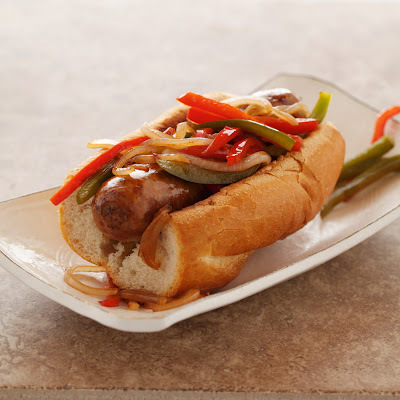 Sweet or spicy Italian sausage links are grilled or sauteed until glistening and crisp then tucked inside of a crusty Italian roll and smothered with tender cooked onions and bell peppers. You can get a Sausage and Pepper Sandwich from a number of places, but for the purest Fenway experience, go to the The Sausage Guy, also known as David Littlefield. Over the last decade The Sausage Guy has sold millions of his sandwiches and has become a local celebrity and bona fide tourist attraction. Like most of you, I won't be at the Red Sox-Yankees game, but that doesn't mean we can't be there in spirit. So do what I plan on doing. Make yourself a Sausage and Pepper Sandwich, or as many New Englanders say, "a soss-age n' peppiz." Crack open a cold one. Watch the game. Realize that, yes, life is good. 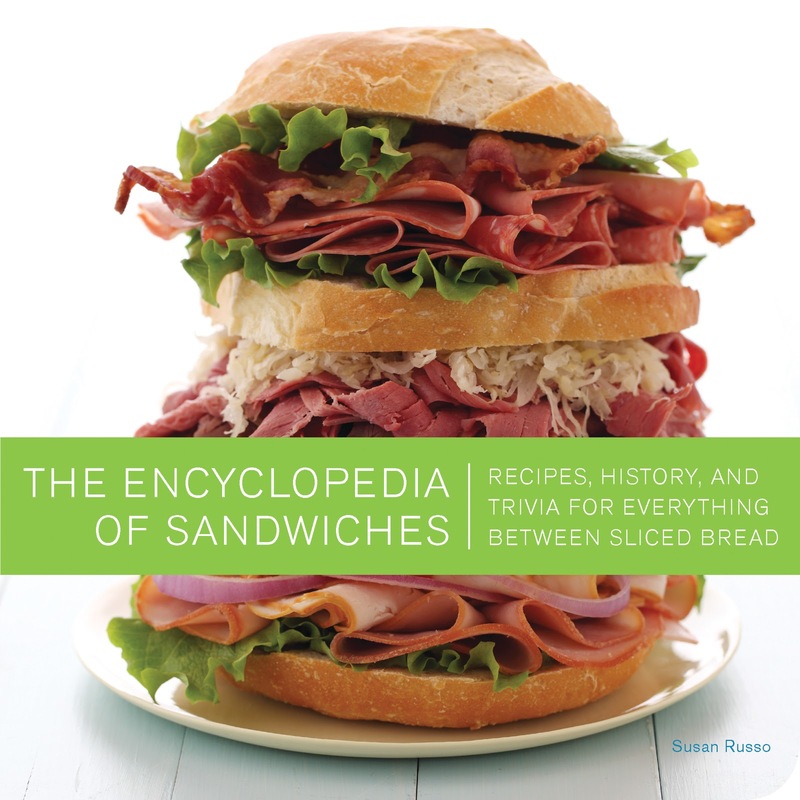 The Encyclopedia of Sandwiches shares recipes, history, and trivia for over 100 beloved meals between sliced bread. Each sandwich, as you can see from the images here, is accompanied by a full-color, gorgeous photo beautifully styled by Adam C. Pearson and photographed by Matt Armendariz. You can pre-order your copy today! 1. Place oil in a large skillet over medium heat. Add sausage links and cook, turning until browned all over, about 5 minutes. Ad bell peppers, onion, salt, and crushed red pepper flakes. Reduce heat to medium-low and saute, turning occasionally, about 5 minutes. Add wine or water and cook until most of the liquid has evaporated, about 2 to 3 minutes. The meat should be thoroughly cooked and the vegetables tender. 2. Brush rolls with olive oil and broil 1 to 2 minutes, or until golden and crisp. 3. Open 1 roll. Place 1 sausage link firmly inside. Smother with a quarter of the peppers and onions. Repeat with remaining sandwiches. Eat immediately. Oh wow, that looks great! I received your book in the mail to review and so far, I LOVE it! I plan on making some this weekend to try out! as a displaced east coaster (from New York) living on the west coast (Portland), I love seeing you (a Californian) writing about the Yankees-Red Sox rivalry. This just made my morning! My grandfather cooked sausage and peppers during the summers and put it on crusty white Italian bread. That was what I missed most when I gave up red meat. Thank goodness I can now get turkey or chicken sausage and this old favorite is back on my menu. Oh you are making me miss boston WAY too much with this post and this sandwich! My review copy of the book just came in the mail and I can't decide what to make! Everything looks delicious! oh my gosh. i have been craving hotdogs for a month now. (and i'm usually "vegetarian"...) i'm going to make this on Friday yumyumyum. jennb-Yay! I'm so glad you like it. healthymama-It's not hard to do! KJ-I'm glad you found delicious alternatives. lindsay-These taste much better than soy sausages! we just got home early this morning from a trip to boston which included a tour of fenway! these look just marvelous! Just made your Breakfast Biscuit Sandwich and blogged about it. So yummy. Your new book sounds great. Will need to get a copy. I've been to Fenway on one muggy simmer visit to Boston, and our memories of those sausage sangwiches have come up so many times in conversation over the years. The combo has also morphed into pasta dishes, omelets, rice dishes..you name it, we've made it. Pure heaven. And congrats on yet another book! You're a writing machine!